BISS | What Does BISS Mean? Parent: Make sure that you're home by 9. Child: Why can't I stay out until 10, like everyone else? Of note, "Because�I�Said�So"�is�the title of a�2007�romantic comedy film�directed�by�Michael Lehmann�and�starring�Diane Keaton. 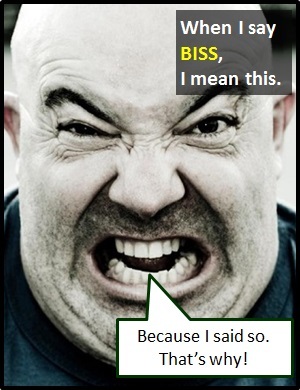 BISS can also mean "Because I say so". "Because I said so" is typically the answer given by a frustrated parent to a trying child. Teenager: Dad, if you smoked and drank alcohol when you were 15, why can�t I? Even though BISS is an adverb of reason, it is commonly used as a standalone term, i.e., it is not often used as part of a wider sentence. BISS is an initialism abbreviation. Technically, this means it is pronounced using its individual letters (i.e., Bee Eye Ess Ess). However, as the abbreviation BISS is typically used for efficiency in writing and not for efficiency in speech it is not often uttered using its letters. Initialisms contrast with acronyms, which are spoken like words. Before the digital era, we might have just said "Because I Said So" or "Because I Say So" instead of using the abbreviation BISS.